This entry was posted in PL and tagged nowości on May 2, 2013 by FEMEN. “Amina” de Femen, quelle image pour la femme tunisienne ? This entry was posted in FR and tagged nouvelles on May 2, 2013 by FEMEN. This entry was posted in UA and tagged блог on May 2, 2013 by FEMEN. 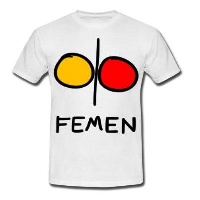 This entry was posted in IT and tagged notizie on May 2, 2013 by FEMEN.